In accordance with the long term commitment of Nexum International in providing a product attuned to today's computing environment, the new NetPhantom version 6.9 focuses on server-side functions and client enhancements that support the developing innovations in Java. 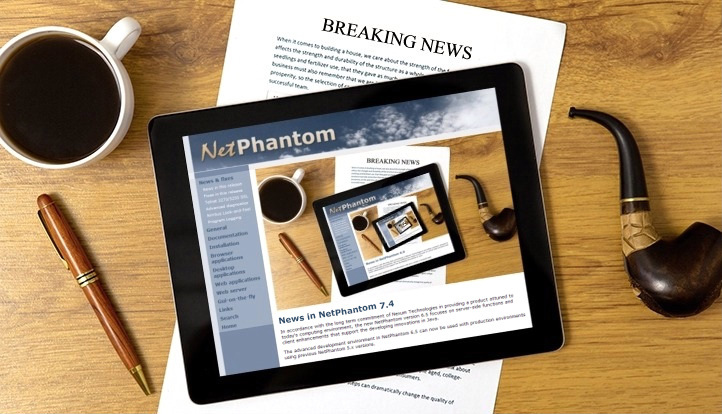 The advanced development environment in NetPhantom 6.9 can now be used with production environments using previous NetPhantom 5.x versions for customers having an extended support agreement. It facilitates the migration to the version 6.9 considerably. Below are news implemented in NetPhantom 6.90 since version 6.70 Build 6700. Also see news in the previous versions. NetPhantom Quick Start is now bundled with Eclipse 4.9.0 (2018-09) for Java Developers (32-bit). NetPhantom Quick Start is bundled with Java SE Development Kit 8 Update 202 (JDK 8u202). The NetPhantom certificate has been updated (SHA-256 from Symantec/DigiCert) and is valid until February 2022. The Quick-Start SSL self signed certificate has also been updated. NetPhantom Quick Start is bundled with Java SE Development Kit 8 Update 192 (JDK 8u192). The NetPhantom Client, Server, Cluster Controller and License Manager now supports running 64-bit versions of Java 9.0.4, 10 or 11. The NetPhantom Client will handle screen DPI scaling on System Level, not on a Monitor/Display Level. The unlimited Java cryptography for Java version 1.8 update 151 and better (including Java 9 and better) is now automatically turned on by the NetPhantom Server, NetPhantom Editor and the NetPhantom Client (when running directly as a Java program or from NetPhantom Starter). NetPhantom Client running with Java Web Start must configure this on the client side by changing the Java cryptography policy settings, see Oracle's Java documentation on this issue for more information. Support for HiRes DPI screens is now available in the Editor. By default the edited panels are using scaling of 100%, but this can easily be changed in the Editor to the request scaling level. The NetPhantom Editor will handle screen DPI scaling on System Level, not on a Monitor/Display Level. NetPhantom Quick Start is now bundled with Eclipse Photon 4.8.0 for Java Developers (32-bit). NetPhantom Quick Start is bundled with Java SE Development Kit 8 Update 181 (JDK 8u181). The NetPhantom Client now partially supports running 64-bit versions of Java 9.0.4 or 10 or better. There are two known problems with the rendering of comboboxes and spin buttons under Java 9 and 10. We are currently working on a workaround for this problem, or to get Oracle to fix this Swing problem. As long as this is not fixed, the NetPhantom Client will log a message in the console about the drawing problem. The NetPhantom Client will handle screen DPI scaling on System Level, not on a Monitor/Display Level. NetPhantom Quick Start is now bundled with Eclipse Oxygen 4.7.3a for Java Developers (32-bit). NetPhantom Quick Start is bundled with Java SE Development Kit 8 Update 172 (JDK 8u172). All NetPhantom programs as the Client, Server, Cluster Controller and License Manager, etc., no longer supports Java 6. The NetPhantom Server, Cluster Controller and License Manager now supports running 64-bit versions of Java 9.0.4 or 10 or better. The NetPhantom Client does not support Java 9 or 10. If a server supports secure HTTPS, and a request that comes from unsecure HTTP can optionally and globally be redirected to the secure HTTPS protocol. Help for Developer's Reference and REXX Language have been updated to be supported under Windows 10. The NetPhantom certificate has been updated (SHA-256 from Symantec) and is valid until February 2019. The Quick-Start SSL self-signed certificate has also been updated.